Will Invisalign Straighten My Bottom Teeth? For years you’ve lived with bottom teeth that overlap, and it’s caused you to pause when you’re having your picture taken or when you’re meeting someone new. You’ve heard about Invisalign, but is it the right treatment for you? Could it align your bottom teeth? Here’s what you need to know about Invisalign. Instead of using traditional brackets and wires to straighten your teeth, Invisalign utilizes clear plastic aligners that are customized to apply gentle pressure and gradually move your teeth. Aligners fit tightly, so they don’t interfere with your normal activities and they also provide discretion. They need to be worn at least 22 hours per day to achieve your desired results. However, since they can be easily removed, there are no restrictions to your diet or changes to your home care routine required during your treatment. 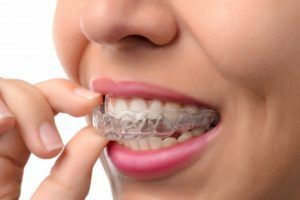 Invisalign works well for most patients; however, it’s not capable of correcting complex bite issues. Many dentists and orthodontists are certified Invisalign providers, which means they’ve had the training to determine which cases will achieve the best results with Invisalign. They can also determine if aligning only one arch is in your best interest. In order to protect the integrity of your bite, it may be necessary to make some adjustments to your upper arch along with your lower arch. Each case is different, and your certified Invisalign provider can discuss the best options for your needs. If you’d like to learn more about Invisalign, schedule a consultation with an Invisalign provider. Once they determine that Invisalign will work for you, they’ll use 3D imaging to create your treatment plan, which will be used to fabricate your aligners. They’ll even be able to show you how your teeth will look when treatment is completed, before you even get started! Don’t wait any longer to learn more about what’s possible for your smile! Give your Invisalign provider a call today to schedule your consultation. At East Islip Dental Care, Dr. Michael Wakily is our certified Invisalign provider. He’s an expert at creating beautiful smiles with Invisalign, and he can work with you to determine if Invisalign is right for your needs. If it’s not in your future, Dr. Wakily can discuss other treatment options that can help you achieve your goals for your smile. If you’d like to contact Dr. Wakily, you can call East Islip Dental Care at 631-983-4660, or reach him through our website. Comments Off on Will Invisalign Straighten My Bottom Teeth?